I recently purchased more of the forgeries I have been warning about for almost three years now. Still no end of the movement of them onto the market. My research into the printer has enabled me to discover modern fake stamps have been created in 2014!! They are being spread across the world through online auction sites like ebay and Delcampe. Everything about them is fake except for one dangerous fact, they have the correct perf size. The gum type is different in it being white in color and very shiny. This gum type was not used until much later years, long after Format went bankrupt thus proving they were not produced by the Format International Security Printers. Obvious differences will be shown below. So far I have discovered complete sets of forgeries of the Saint Vincent Union Island Leaders of the World 1984 British Monarchs stamp issues in perforated form. Some call them "Kings and Queens" issues. It is probable that fake imperforates of this issue have been made as well. Up until now there were only imperforates from the unique press sheets found in the archive and on Format Presentation folders. The forgeries are being offered online right now as I write this on August 5, 2017. I purchased some time ago the Leaders of the World British Monarchs sets for St. Vincent and Union Island in blocks. What is nice is they were the specimen overprinted sets. I purchased them from City Collectibles who was the buyer of the Saint Vincent side of the police evidence stock which was confiscated from the Format International Security Printers for the trials against Clive Feigenbaum and his associates in 1989. This stock was held in the police warehouse until 2008! Therefore, genuine in all regards. Here is an image of the lot I received from CC in 2012. I will use them for comparisons. This is evidence showing even a later creation and since these did not appear on the market until recently and no such stamps like these have ever been on the market nor recorded, it proves these to be modern forgeries of the stamps. 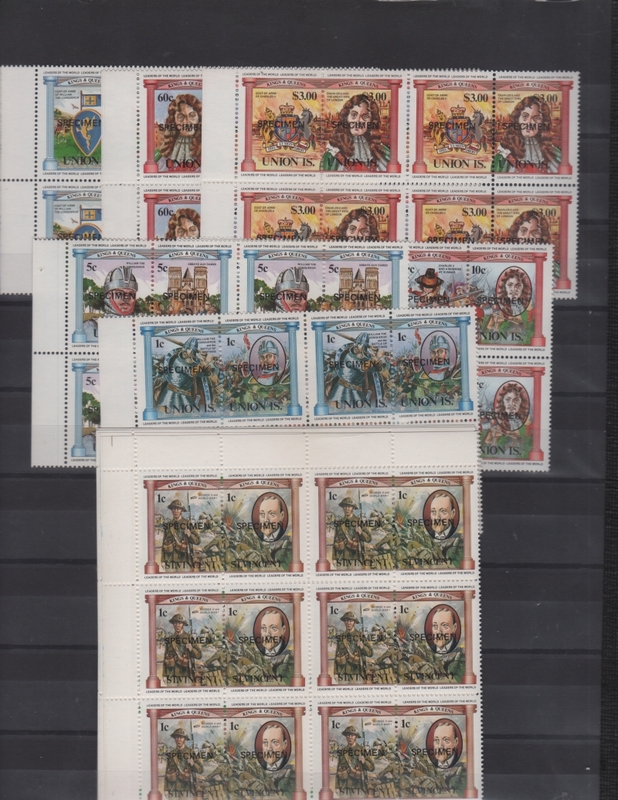 I will use the 1c William the Conquerer stamp pairs for high resolution comparisons. I use 1200dpi scans for viewing. These first comparisons show you how inferior the screens are. I compare the face of William the Conquerer in the portrait. You can see that the screens used are much coarser. Much of the details are lost on the forgery. This reproduction is one of the worst I have seen! The forgeries still are very dangerous because when imaged for sale by sellers they look almost the same as the originals. Buyers will think it is just the sellers scanner making them look "different". 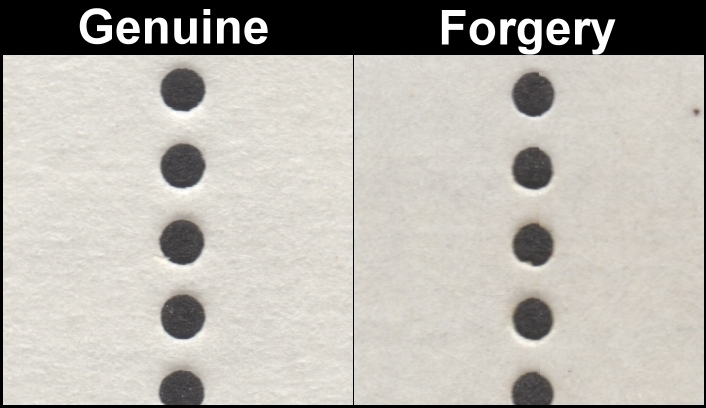 To compensate the forger uses a shinier surface on the face of the stamps. On this stamp you can see the fonts are close in relation to boldness. The forger made one fatal flaw though! The spacing for the words "WILLIAM THE" is farther apart on the forgeries making the two words spread out farther than on genuine stamps. 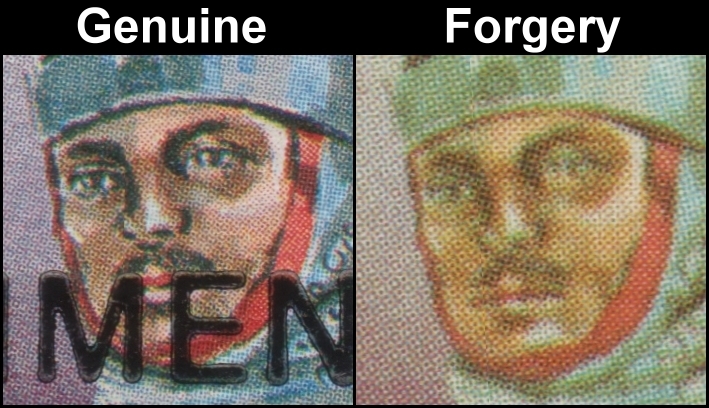 The "W" is in line with the "C" of Conquerer on genuine stamps versus it being far out to the left on fake reproductions. Now let's look at a section of the action image. You can see that the forgery is a horrible imitation of the genuine stamps. Note the extreme color differences in all the above images! I ask you....which would you rather have in your collection? The pillars on genuine stamps are shades of deep aqua-blue versus shades of light aqua-blue on the fake reproductions. The "Kings and Queens" logo band has a very wide area in the middle that is white on genuine stamps versus it being light blue on the forgeries. The colors throughout are much deeper and brighter on genuine stamps. The soldiers hair is much more pronounced and black. 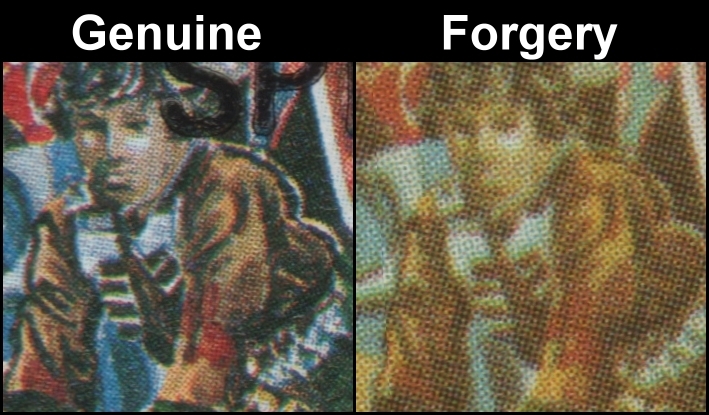 The forgery has an overall yellow-green hue and all areas that are supposed to be black....are brown. Note the bottom blue bar. It is deep aqua-blue on the genuine stamp pair but on the forgeries it is almost white in the middle of the two stamps. An obvious forgery when placed next to a genuine stamp. Very poorly made. The pillars on genuine stamps are shades of light aqua-blue versus shades of deep aqua-blue on the fake reproductions. The "Kings and Queens" logo band has a very wide area in the middle that is white on genuine stamps versus it being light green on the forgeries. The colors throughout are much deeper on genuine stamps. The kings armor is very light blue versus greenish-blue on the forgeries. Note the bottom blue bar. It fades from light blue but on the forgeries it is very dark blue. 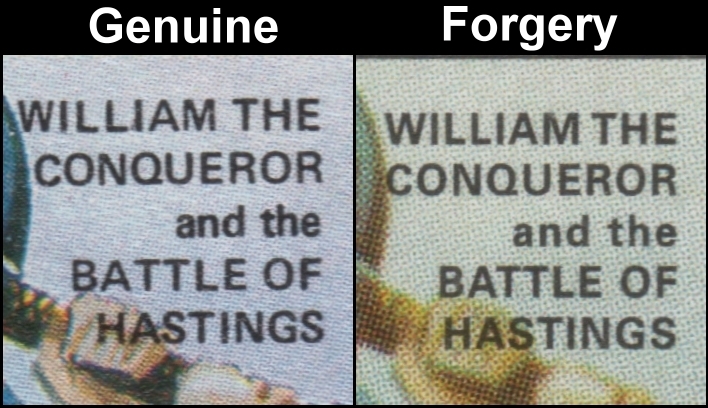 The font letters for "WILLIAM THE" are spaced farther apart on the genuine stamp this time making the "W" and the "E" sit farther to the left and right of the word "CONQUERER" versus them being in line with the "C" and "R" of "CONQUERER" on the forgeries. Obviously the pillars on genuine stamps are shades of red versus shades of reddish-brown on the fake reproductions. The "Kings and Queens" logo band light red on genuine stamps versus it being light brown on the forgeries. The colors throughout are much deeper on genuine stamps. The smoky background in the image is gray-blue on genuine stamps versus greenish-blue on the forgeries. Note the bottom bar. It slightly fades from dark to light brown on the forgeries versus reds on genuine stamps. Look very closely and you can see the letters "IS." for "UNION IS." are touching on the right stamp on the forgery pair. On the genuine stamps they do not touch at all. The pillars on genuine stamps are shades of blue versus shades of slightly green-blue on the fake reproductions. The colors throughout are much deeper and brighter on genuine stamps. The Coat of Arms is blue on genuine stamps versus dull purple on the forgeries. As you can see the forgery looks much duller than the genuine stamp pair. Note the bottom blue bar. It fades light blue but on the forgeries it is dark blue on most of it. The pillars on genuine stamps are shades of red versus shades of reddish-brown on the fake reproductions. The colors throughout are much deeper and brighter on genuine stamps. This time the kings hair is much more pronounced and shades of brown versus yellow-brown on the forgeries. The cloudy sky in the background is shades of purple and blue on genuine stamps versus grays and blue on fake reproductions. The "period" in "ST." of the "ST. JAMES PALACE" is next to the "T" under it on the forgeries versus it being far to the right of the "T" on genuine stamps. The colors throughout are much deeper on genuine stamps. The kings hair is much more pronounced and browner. The background colors are much more yellow than on the genuine stamps. Most of the reddish hues are non-existent on the forgeries. Fonts for "Coat of Arms of Charles II" are slightly bolder on the forgeries. 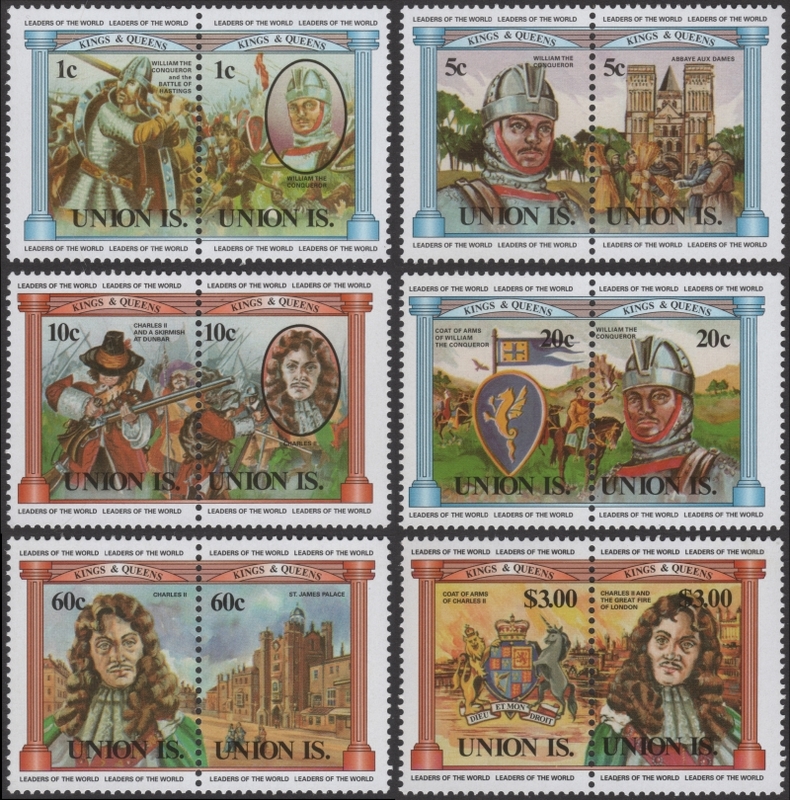 You can now define the fake Saint Vincent Union Island 1984 British Monarchs Kings and Queens stamps easily and can now possibly avoid being ripped off! Sorry to say this, a lot of you already have been fooled and more of you will be until the right people get serious about it!